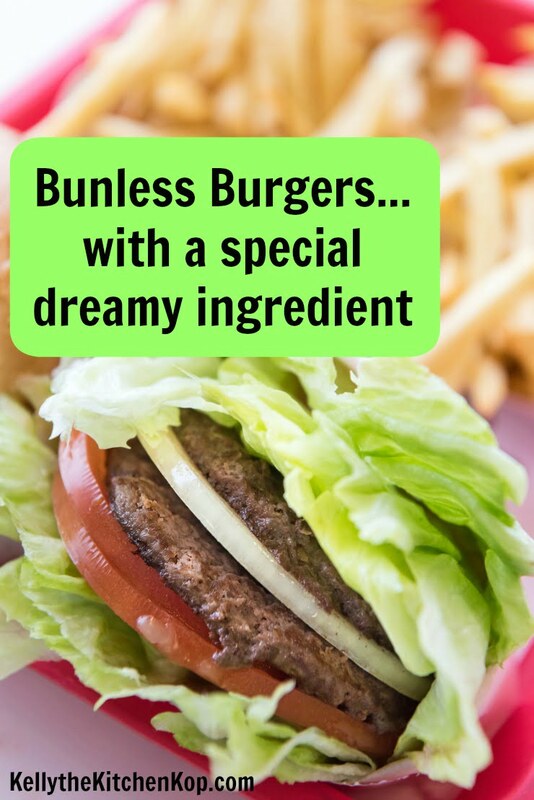 It wasn't that long ago that the thought of a bunless burger sounded as strange as not eating bread on a daily basis. But now I like eating my burger without a bun (you'll see why when you read this recipe), and bread is a once-in-a-while thing. This meal is one of my favorites because it's easy to adapt a regular dinner of burgers on the grill for the whole family to a bunless burger for me without making anything separate. The following is for one big serving. Grill or fry the hamburgers, we like them both ways. (Here's where to find healthy grass-fed meat if you don't have a good local source.) You might like to chop up an onion to mix into your meat before cooking like we do for more flavor. 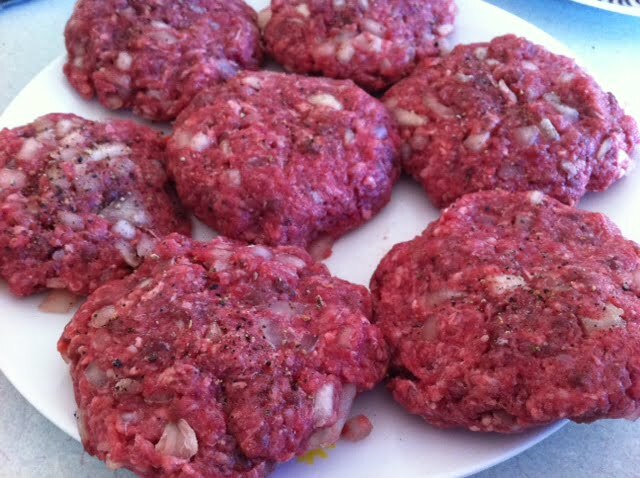 We also buy pastured ground beef that has heart ground up with it for more nutrients. There's no taste difference, not even a little, unless you count how it tastes a little like steak. Don't forget to sprinkle with sea salt and pepper for best flavor. Either melt a piece of cheese on top of your burger, or just add some shredded cheese as you're putting the rest of the ingredients together below. 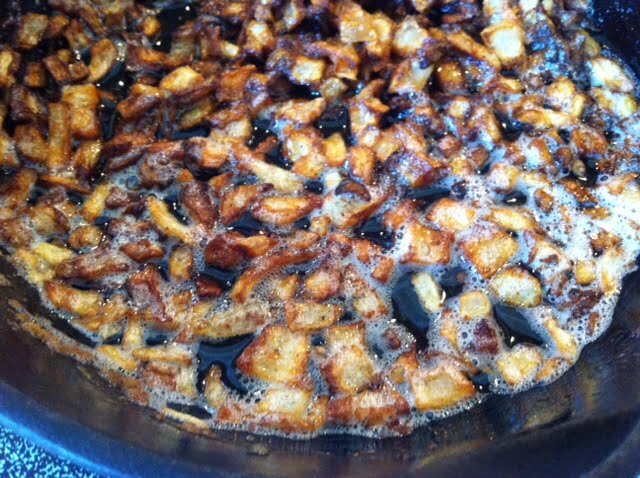 Secret Ingredient: This truly makes the burger DREAMY… In the meantime, in a small frying pan sauté a whole chopped onion with 4 T. butter, moving the pieces around often, until onions are nice and golden brown. (I like them really golden brown.) This takes less time if your heat is on the medium-high side, but don't leave them or it burns quickly. (You never want to eat burnt food due to the formation of free-radicals which can cause cancer.) 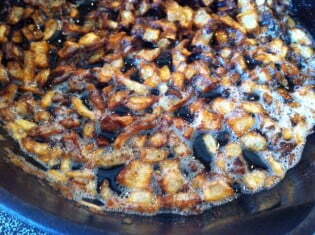 You could also add a splash of balsamic vinegar to caramelize the onions even more, yum! ***Even better, try this onion jam recipe!! A few handfuls of romaine lettuce, torn. Your cooked hamburger, cut into bite-sized pieces. About half of a tomato, cut into bite-sized pieces. The browned onions. This gives it such a yummy crunch! Shredded cheddar cheese, unless you melted some on top. Anything else good that I forgot? I can't wait to hear if you love this as much as I do! I eat Real Food, why can't I lose weight? We love eating our burgers this way. This is the only way we eat burgers. Ground heart mixed with ground beef in any ground meat recipe is the bomb. I wanna try beef heart in my summer sausage recipe lol. How long will the home made mayo last in the fridge? This is FABULOUS!!!! I’m addicted!!! This looks amazing, and I can’t wait to try it! We usually eat cheeseburger patties cut up and dipped in ketchup and/or mustard. It’s a favorite of my 3 1/2 year old son. This would definitely jazz things up for hubby and I though. Thanks!! Would love to hear some thoughts on getting “good carbs” without so much grain? I find I really need carbs, especially in the morning, and end up defaulting to breads usually but would love some other simple ideas to get carbs without the grains. I am with you on the soaking vs not issues…… it’s rather confusing to me as well! Our kids love burgers…….. Wouldn’t yours be all over it if you served it with ketchup and pickles?? We do serve them with ketchup and pickles, but they still struggle to swallow their bites. You know how kids will take bites and then use milk to wash it all down. They don’t like meat loaf either, which is so amazingly good out of the Nourishing Traditions cookbook. My daughter will eat sauted ground beef with sea salt added or even onions added. I don’t understand why she won’t eat it in a burger form, and my son will eat tacos. He loves the taco meat, which is the same grass fed ground beef with seasoning. Oh, well, at least they eat the meat in other forms. Since they don’t like the burger form, they might like your salad. We’ll give it a try. Thanks for the recipe! I’d call it hamburg salad myself.. regardless of what you call it it looks delicious. This is a must try. 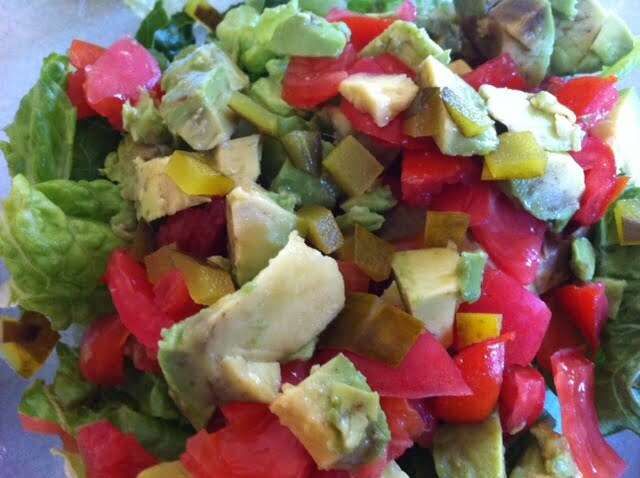 Throwing it, into the salad, also cuts down on how many hamburgers, one would eat, normally. I only eat one but hubby can handle a few. With alll those good ingredients, I think , one would be enough for him, too. I had my first bun free hamburger recently. I cut it into bite sized pieces and mixed it with fermented veggies. Loved it. I’ll have to try your better bonanza soon. -The recent confusion over how best to soak grains has me irritated, so it seems easier to avoid them. I can’t speak for “everyone”, but since giving up grains I feel much better and have lost quite a bit of weight. I know properly preparing grains can mitigate some of the toxins, but the fact remains there is absolutely nothing in grains that can not be gotten just as easily from much more nutrient dense foods. And, I guess I’m just too lazy to soak, dry, and then grind grains just to have a piece of bread. I’d rather just skip the bread altogether. Also, my diet isn’t low-carb: I eat lots of fruits and veggies, as well as occasional legumes. I don’t count carbs; I just skip the grains and sugars. It’s a moderate-carb diet. I can understand grain free, but it seems like people who do paleo, or something close to it are forming an elite “we’re doing the traditional diet best” club. 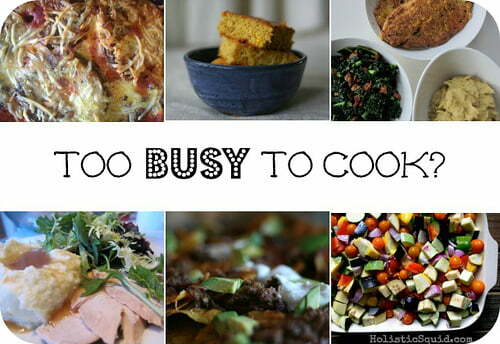 I read a lot of real foody blogs and this is just an impression I am getting. This looks and sounds amazing, Kelly! So simple, so genius! I’m like you, everyone loves burgers, but it almost seems wrong to eat one without a bun, but this recipe would certainly quickly cure anyone of thinking that! I’m sure my boyfriend would even be happy to chow this down! I can’t wait to give it a try.